Auckland, New Zealand – early morning at the international airport AKL. After a long overnight flight from Bali I finally arrive in New Zealand. I head to collect my bag and find out to be the lucky one as I get asked to step into a separate line for additional questioning before entering NZ. I was surprisingly well rested and took this as another chance to meet people. But you never know how things turn out to be – and so this unbelievable story happened – well, it is not even a story, it is reality and it definitely was the best way to get my day started. Two counters in front of me, but occupied with an immigration officer each and separated from the other (fast) tracks by some walls. Somewhat told be to chose the left officer: an older man with greyish white hair and a beautiful smile. He seemed a grandpa like person, very helpful and kind. To keep this a bit more vivid i decided to keep this as a dialogue. The immigration officer being IO and me being V.
IO: How long do you intend on staying in NZ? By the way I love your hat! V: 3.5 days and thanks so much! I noticed him staring at me in wonder. V: I know it is a very, very short time and not what I wanted to be. But there was a volcano eruption on Java in Indonesia and I got stuck on Bali for another week. I really wanted to come here earlier and get the chance to see more of this lovely country. IO: Oh, well fair enough. I’m sure you’ll come back some day. So what do you know about NZ and what do you want to visit in such a short time? V: I’m collecting my rental car as soon as we are finished here and then I drive South to visit the Waitomo Glowworm Caves, for tomorrow I want to go skydiving and visit the Lord of the Ring/The Hobbit film set in Matamata. Followed by visiting Rotorua and then heading back to Auckland for the last night. IO: Wow that sounds like a plan. He flips through the pages of my passport and notices the many stamps. IO: You’ve been around quite a bit! I see you’re a student, what do you study and how do you fund your travels then? V: I just finished my bachelor degree in Industrial Engineering and as for the funding part I have several backgrounds for that. V: I work part-time so I make my own money and use that for travelling. But I also have a travel website – I wasn’t sure if he know what a travel blog was, so I tried to keep it general – and it goes quite well so I work with a lot of tourism boards and destinations. They invite me to travel their country and in return I write about my experiences and the different angles of said destination. So I either get invited to join trips or I have sponsors that help me fund the trips. IO: And for this trip you got a sponsor? V: – a little bit proud – Yes indeed. It is a German publishing house and TV channel. I’m filming ever single day of my trip and they use the footage, edit it and put it together nicely. IO: And who is this sponsor? V: I’m not sure if you’ve heard about it. It’s Marco Polo. IO: Oh yes, I know them! Very impressive! Great work! Then he focused a bit on the screen in front of him. IO: This just takes a little while, I just have to fill out all those boxes. IO: So you are a diver, hiker and adventurer? I couldn’t believe my ears. Did I just hear right?! Did the officer just really read a line from my blog to me? V: Um, Sir, did you just google my name? IO: I sure did! Chronic Wanderlust, aha! Very funny! Great name! I couldn’t help but giggle at that point and put a wide grin on my face. V: Thank you again! I try my best! IO: Let me just copy that to the immigration documents and you’ll be good to go soon. Apparently he was going through the “About me” page on my blog and started copying parts to the official documents. When he finished he took my passport, looked for an empty page and put a stamp in it. IO: Off you go, have a great trip and safe travels! I thanked him and rolled my trolley out and stepped onto kiwi land for the first time in my life. The first time visiting Middle Earth. 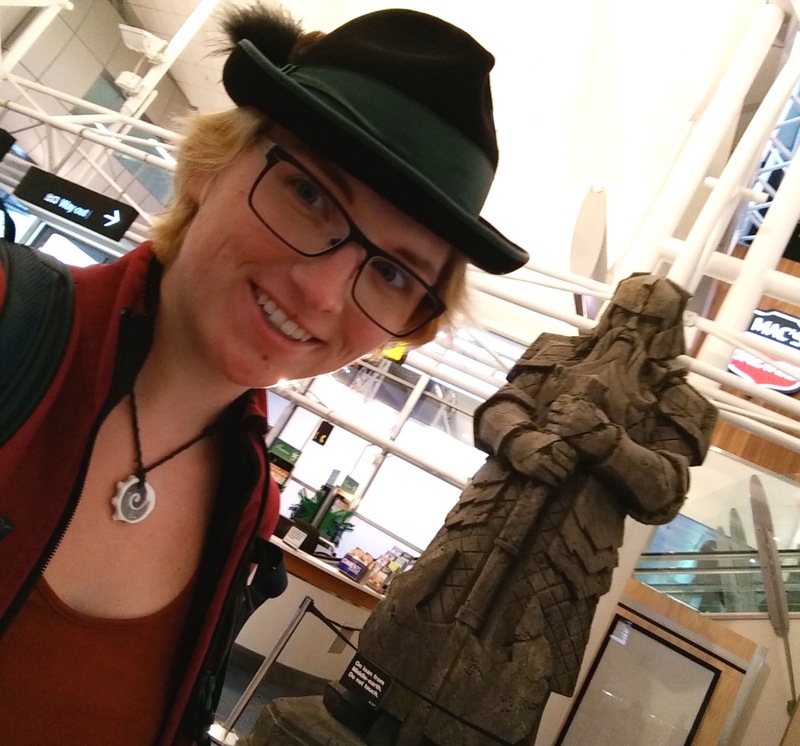 Not even in my most vivid dream I had expected anything like this: In the arrival hall a huge statue of a dwarf welcomed me. The obligatory selfie was made before I headed to collect my rental car and drove and drove! What are your best immigration stories? I’ve had some pretty unfriendly officers, but also very friendly ones that I shared a great talk with. Let me know in the comments below! IO: What do you do for a living? Another conversation in Vienna International Airport went like this. I’ve had two rather unpleasant conversations: one time in the US when an officer shouted at me for no particular reason and one time when I went to Canada and they asked me for 15 minutes and then sent me to a different counter where I had to answer the same questions again….